While being an accountant involves many diverse responsibilities, there's no need to manage them all with an array of disconnected tools. With ClickUp, you can handle everything from one all-encompassing project management platform! Your Team represents your entire firm, including members from all of your company's different departments. It represents the overarching container for the rest of your workflow. Create a Space called "Accounting" to manage your clients and business-related action items. If needed, you can create an additional Space to manage internal, administrative items. There are a couple of options for setting up your Projects and Lists within your "Accounting" Space. Option 1: Create two Projects called "Accounts Payable" and "Receiving". Use Lists to break down these projects by month. Option 2: Use Projects for each of your clients. The Lists within these Projects can be utilized to break down the services you provide for each client. Custom Statuses: When it comes to dealing with other people's money, tasks are very rarely "done" or "not done". Add custom status workflows to indicate the progression of a task to your teammates. You can implement these at the Space or Project level. Zapier Integration with Google Forms: Attach client-submitted forms directly to ClickUp tasks and Lists. Custom Fields: Create a completely unique task field to set a value, budget, client contact number, and more. This is the perfect way to store all of your relevant client data directly in ClickUp. Recurring Tasks: Prompt tasks to automatically open for important repeat actions, such as quarterly tax filing deadlines and invoice requests. Templates: Create templates from your favorite Spaces, Projects, Lists, tasks, and checklists and reuse them at any time. This is perfect for speeding up your client on-boarding process, keeping track of invoice requests, and pretty much anything else you can think of. Time View: Visualize your upcoming tasks on the ClickUp calendar, or quickly drag and drop unscheduled items to arrange your day. You can even sync up your Team with your Google Calendar account. 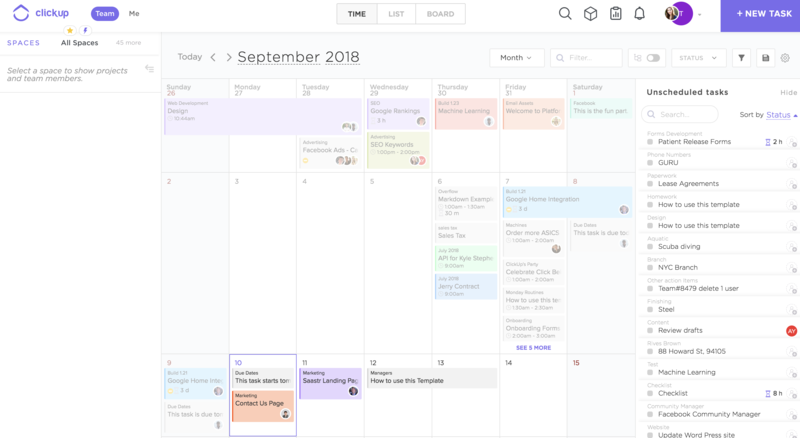 Any changes made from Google Calendar will automatically be reflected in ClickUp as well!